How do you hang up your clothes? Do you toss them on a hanger and just hang them anywhere in your closet? Or do you have some kind of method? Am I the only weirdo who had some kind of method? I keep my clothes separate by purpose. For example, my work clothes are all together in one area of my closet and my dress clothes are all together in another area of the closet. I don’t know if you’re a weirdo, but I had a very abusive ex and when I saw his closet I got really scared. He had all grey pants, then green, then brown, then blue…. He had a drawer full of nothing but sunglasses. He had pictures of only himself all over his room. It reminded me of that guy from Sleeping with the Enemy. I make it a point to have a little disarray. If I can keep clothes on the hanger, I’m doing well. @Trillian Ah, yeah, I’m not that kind of crazy! :) I mostly do it so I don’t lose some of my clothes, as sad as that is. Haha! I’m similar to @Seaofclouds, I keep work clothes on one side and everything else on the other. Yes, I hang most everything including t-shirts I wear often. I buy tiered clip hangers for skirts so I can have 5 at a time on each hook, all kept neat/ Pants go on individual clip hangers. I’m weirdo enough to write down each day’s outfit since I often work 7–9 days at stretch and don’t want absent minded repeats. Rotating my clothes like that also makes it seem like I have more outfits than I really do and keeps me from wearing one favored thing out before the season is up. I just swapped out my cold weather clothing for the warm damn Jersey and your damn weather, and I tried to be somewhat organized this time. I put them in order of occasion rather than color: casual dresses, short sleeve tops, work pants, etc. I only separate them by long-sleeve and short-sleeve. That’s what I do here at college and that’s what I did at home. And of course I had a separate section altogether for jackets and sweatshirt-jackets. Recently I read an excellent de-cluttering trick. Turn all the hangers in your closet 180 degrees, hang them over the back of the closet pole, so you have to push things back and down to remove. After wearing, hang them normally. After 1 year, throw/give away everything which is still hanging backwards. My clothes go on shelves in my closet. 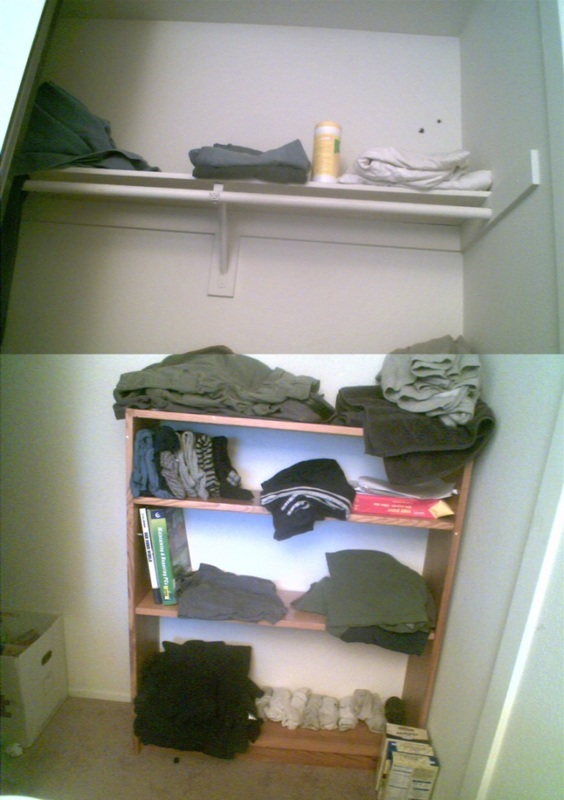 I separate my shirts into 3 basic color groups: Blues+greys, browns+greens, blacks. I separate my shorts, either they’re shorts that I wear to school/out, or they’re basketball shorts that I wear around the house. My jeans go up on the highest shelf because I live in SoCal, and I wear jeans probably 2 days out of the year. Socks, boxers, and towels go in the rest of the open spaces of my shelves. I hang belts up on a bar that goes right below the top shelf. I have my “fancy” shirts and pants hidden on the far side of the closet, because I barely ever need them. A picture from a few weeks ago, about half-way between laundry days. If you’re weird, I’m weird. I group by long/short sleeves and arrange by color…my shirts look an art room color wheel with all the varying hues. I hang almost everything I own and I hang it directly out of the dryer ‘cause me and my iron don’t get along. But— what it buys me is making it really speedy to get dressed in the morning. I know exactly where everything is, and needing a white top, I can see them all at the same time in the same place. The 5 minutes of extra sleep it buys me is worth any extra effort putting away my laundry. My clothes are color coded. I start with the whites, then tans, yellows, pinks, reds, purples, browns, then the blacks. Within those color coding the shirts start from sleeveless to short sleeves to the longer sleeves. My pants are in another closet and are color coded also. “Work” clothes (which means cleaning the gutters, painting the floor, etc) in a hamper. The ones on the bottom are 30 years old and won’t fit me any more if I ever dig them out. I wear the top two pairs of pants and the top two painty tshirts and sweaters. “All the time” clothes on hangers in no particular order, but the closet pole’s not inside a closet, it’s just hung up on a wall between bookshelves, so I can see everything all the time. “Nice” clothes in a closet, all in whatever order I wore them in. Now and then I find something pretty that I’d forgotten about. This is a perfect system. lucillelucillelucille is right: hanging up pants is wrong. My husband hangs his clothes according to the order he wears them. Newly cleaned goes in on the left side, and today’s comes out on the right side. He keeps the long sleeved separated from the short because of the weather and season. All my clothes are folded and kept in drawers, except the few ‘dressy’ clothes I have. Shirts with shirts, then colour-coded. Skirts with skirts, the same. Trousers with trousers, ditto. And my dresses look like a rainbow, as I hang them ROY G. BIV, with white on one end, black on the other. I just got those velvet hangers and they work a no-slip treat, plus using them has made more room in my closet! I haven’t had access to a closet since me and my girlfriend moved in together. First row: Work clothes. Divided by warmth: t-shirts, long sleeve t-shirts, sweat shirts. Logos all point to the right. Second row, left to right: long sleeve t-shirts: prints first, then dark colors progressing to white. All pointing to the right. Then, short sleeve t-shirts: same order as long sleeved ones. Jeans: more popular in the left and all going from dark to light. Sweatshirts: divided by poplularity. All point to the left. Nice clothes: no order, they just point to the left. If I hang, I color-coordinate. @loser Did you read all the other posts? You aren’t weird, it appears you are with the norm. 4 groups in my closet: Dresses, coats/jackets/hoodies, pants/skirts, shirts. Then I organize the dresses by their formality, the pants & skirts by their length, & the shirts by type (t-shirts, sweaters, polos, blouses, & “skimpies”). And I try to keep everything organized by colour. This lasts for about a week, untill it’s just in basic groups. How do you feel about using alternative therapies? Is there anything that will take stage makeup out of clothes?